For several decades, medical researchers have been working on a way to turn brainwaves into instructions for an external device. These brain-computer interfaces, first developed in the 1970s, hold enormous promise – they could let paralysed people move again, and augment or even replace the way we interact with the world. Unfortunately, existing brain-computer interfaces are slow and tricky to learn. But now a group from Stanford University has developed a new model designed for typing which outperforms every previous device to date. To use it, three volunteers suffering severe limb weakness disorders agreed to have a small pill-sized electrode array implanted in their brain. The array records signals from the motor cortex, which controls muscle movement, and uses an algorithm to translate them into instructions for the computer to move a cursor around an on-screen keyboard. 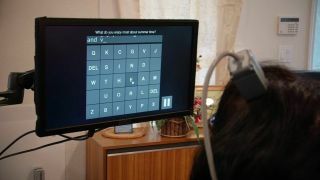 After a short training period, the participants were able to outperform all previous brain-computer interface tests on people with similarly impaired movement. One participant managed 39 correct characters per minute. It's believed that with the addition of automatic word correction software, this could be boosted even further. "This study reports the highest speed and accuracy, by a factor of three, over what's been shown before," said Krishna Shenoy, a Howard Hughes Medical Institute investigator who's been pursuing BCI development for 15 years. "We're approaching the speed at which you can type text on your cellphone." The researchers believe that future versions of the device will be wireless, fully implanted, self-calibrating, and able to be used around the clock. "I don't see any insurmountable challenges." Shenoy said. "We know the steps we have to take to get there." Dennis Degray, one of the study participants, added: "This is like one of the coolest video games I've ever gotten to play with. And I don't even have to put a quarter in it." The full details of the system were published in the journal eLife.